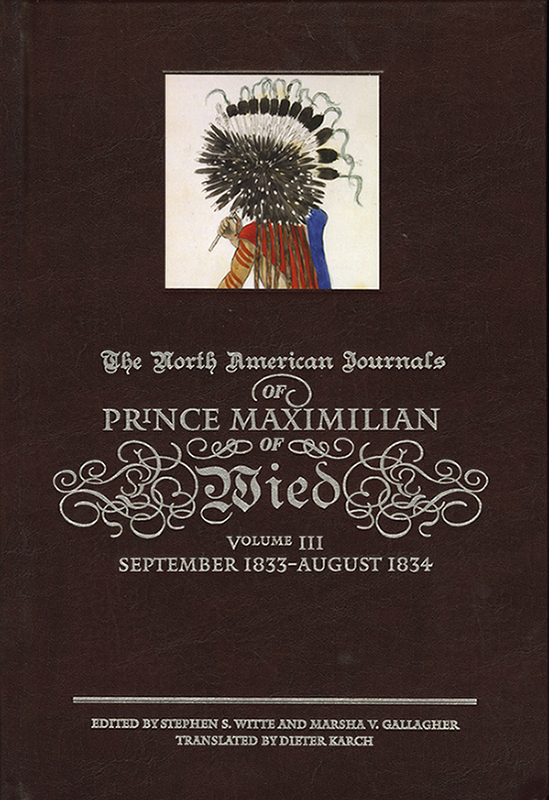 The North American Journals of Prince Maximilian of Wied. Volume 3: September 1833-August 1834. Foreword by John Wilson. Illustrated; 544 pages; hardcover. Joslyn Art Museum in conjunction with University of Oklahoma Press, 2012. Few historical chronicles are as informative and eloquent as the journals written by Prince Maximilian of Wied as a record of his journey into the North American interior in 1833–34, following the route Lewis and Clark had taken almost thirty years earlier. Maximilian’s memorable descriptions of topography, Native peoples, natural history, and the burgeoning fur trade were further brought to life through the now-familiar watercolors and prints of Karl Bodmer, the young Swiss artist who accompanied him. The first two volumes of the North American Journals recount the prince’s journey from Europe to St. Louis, then up the Missouri some 2,500 river miles to the expedition’s western endpoint, Fort McKenzie, in what is today Montana. In this third, and final, volume, Maximilian vividly narrates his extended stay at Fort Clark (near today’s Bismarck, North Dakota) and his return journey eastward across America and on to his home in Germany. Despite subzero temperatures and a shortage of food at Fort Clark during the winter of 1833–34, Maximilian continued to study and interview the Mandan and Hidatsa Indians who lived nearby, recording descriptions of their social customs, religious rituals, languages, material culture, and art. This handsome, oversize volume not only reproduces the prince’s historic document but also features every one of his illustrations—nearly 100 in all, including several in color—from the original journal, along with other watercolors, now housed at Joslyn Art Museum in Omaha, Nebraska. Publication of these journals, fifty years in the making and complete with extensive annotation, opens the 1830s American West to modern readers in an indispensable scholarly resource and a work of lasting beauty.